The Moon’s Nodes – what will their Cancer/Capricorn transit bring? The Moon’s Nodal axis shifted into Cancer/Capricorn early in November 2018, and will remain there until early May 2020, bringing with it some ‘interesting times’ indeed for us both personally and collectively through the Cancer/Capricorn eclipse season and strong links with both Saturn and Pluto in Capricorn. Various astrologers are now writing on our collective Wall (mostly the Internet, these days!) about what looks to be an especially interesting, turbulent, radically changeful period. No doubt I will be adding to all that in due course! However, in keeping with the reflective mood which affects many of us as we struggle to emerge from the Festive Fug, my thoughts are currently more focused on personal themes. With the Nodes exactly conjunct my MC/IC axis at 28 Taurus/Scorpio, I always feel their transiting shift strongly, see themes arising in my personal life which bear the stamp of the prevailing Nodal energies, and prepare to work as best I can with the challenges arising. Cancer/Capricorn energies at a personal level concern our feelings and experiences centring on the relationship with home and family, the pursuit of emotional security and a sense of belonging. They also describe the responsibilities which we need to face and take on in those areas of life, as well as facing the pain of inevitable times of separation and loss, or the realisation that we may be looking for security in the wrong places, or with the wrong people. The main goal is to arrive at what we need both for ourselves and for the nurturing of those we love and value, whilst being realistic about what life may withhold from us, no matter how hard we try to acquire what we think we need. In short, when this polarity is being transited by the Nodes, the challenge is for us, whatever stage we may be in life, to grow up emotionally a bit more. 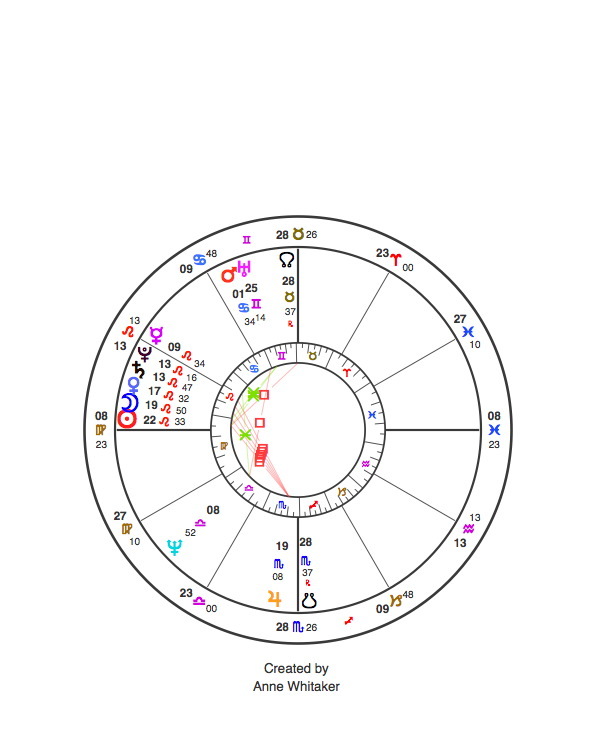 Because the Nodal axis returns every 18-19 years, it’s usually productive to look back at where you were in life the last time it journeyed through Cancer/Capricorn, taking note of which pair of houses was involved. The axis last travelled through Cancer/Capricorn from early April 2000 to early October 2001. What were you doing then? What challenges of the nature of Cancer/Capricorn did Life throw up? What did you gain from dealing with them? And – what issues can you identify already which those planetary energies have begun to bring your way? These are all questions upon which I am pondering at present. At the end of 2018/ start of 2019 I found myself being unexpectedly affected by a powerful emotional response which arose in me regarding an event centring on the place of my birth. It’s a deeply moving story. This entry was posted in Moon's Nodes and tagged Astrology, Cancer/Capricorn, Eclipses, horoscope, Midheaven, Moon's Nodes. Bookmark the permalink. My natal nodes! Capricorn north in the 3rd house, Cancer south in the 9th. Hope this post makes sense to you, then! Sure did! It has been challenging and enlightening, LOL. Looking back to 2000. 2001 is incredibly useful right now ,as ongoing issues relating to 2nd/ 8th (Cap/Cancer)are needed looked at again .Not quite « Déjà vu as I have become much more philosophical these days . That’s good to hear, Patricia! I am so glad that you wrote about your personal experience of the lunar nodes! My North Node is exactly conjunct my Aries Ascendant. I had not considered that this could turn up the volume on the transiting nodes other than just those contacts to my natal placements by eclipses. After reading your post, I looked back through my ephemeris and I was gobsmacked by how much the themes of the signs and houses through which the nodes are moving have been expressed in my life. Thank you for this insight! It really is so fitting that it would come at this time for me. The North Node will be moving through my Cancer 4th House where my Sun, Venus, Mars, and Part of Spirit reside and the North Node will eventually conjoin my Capricorn Midheaven and Part of Fortune. Tomorrow’s eclipse will closely square my NN/SN and AC/DC and oppose my Venus just as Saturn will, in his turn, in the next few weeks. What wonderful feedback, Mari! So glad to know that what I wrote has been helpful to you. It will be good to read part two! Inquiring minds want to know! The year 2000 – 2001 was a very challenging year, yet I also ‘broke away’ to have a life that I owned – and not one that owned me. It was a sobering year, one that taught me many lessons. You are right, Amiga, and as I reflect and look inward as to what is happening now – I can see parallels. I am again at a crossroads, but this time am much more mature, more grounded and enter this time with great confidence. “…the challenge is for us, whatever stage we may be in life, to grow up emotionally a bit more…” – Yes, take a deep breath and embrace the moment! It will be interesting to see what this year holds for all of us, and for this planet. Happy New Year to you and many thanks for this feedback – it really helps us all to learn more about how astrological cycles work in the actual realities of people’s lives. As the Pisces New Moon dawns…what are we waiting for?